Lunch at Pacific Grill and Bald Baby Heads at U.P.S. Living in Tacoma we are never more than a few minutes from Puget Sound. It's influence is everywhere. We live only a couple of blocks away from it and each day that we're home, we can look out most of our windows and see Puget Sound, Commencement Bay, Vashon Island, and the Cascade Mountains. Off to our left is more of Puget Sound and the Olympic Mountains. We love it. 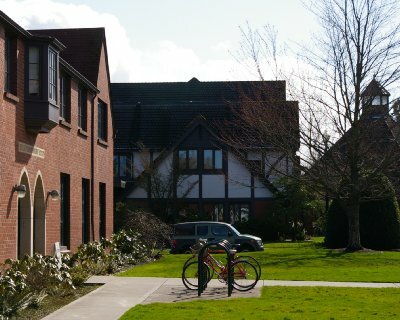 As a matter of fact Peg and I met and fell in love while attending the University of Puget Sound. This early March morning it was going on lunch time and we decided to put on our woolies and go out into the blustery winter day. We drove along Puget Sound to downtown Tacoma and parked within fifty feet of one of our favorite restaurants, Pacific Grill. The last time we stopped in for lunch we had to face driving, sleety rain and freezing wind. We were a hundred and fifty feet away on Tacoma's main street, Pacific Avenue, and our hair and clothes got soaked during the short walk. This time we were closer. The wind was still blowing, but there wasn't any rain. We sat at the bar. Peg ordered Tazo Black Tea and I ordered a Sprite. We decided to share salad, soup, and fish and chips. What a good idea. 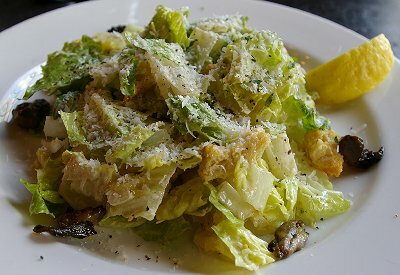 The Caesar Salad had smoked baby oysters and a nice juicy slice of lemon. It was excellent. 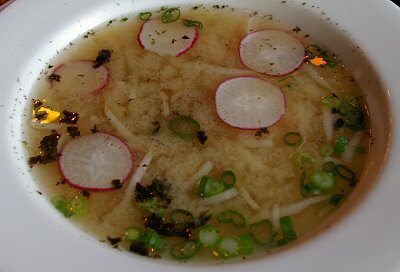 The soup was miso with onions, radish slices, shrimp and pieces of lobster. Well, we were warned there were pieces of lobster, but they eluded our search. Peg loved it because it didn't taste too salty. I thought it was good, but I prefer my miso soup to taste saltier. A slight difference of opinion. I floated most of my croutons in the soup for Peg and enjoyed my salad, while Peg had two small pieces of smoked oyster and some salad, but ate most of the soup. Jack Sprat and all that. We made it work. Later Peg would decide that because she'd only ordered soup, dessert was on our lunch menu. 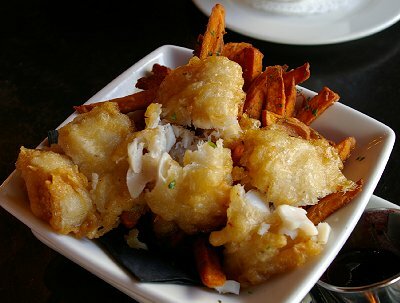 When I ordered the fish and chips I asked for the sweet potato fries as opposed to the skinny garlic fries and deep fried garlic cloves. I have nothing against those fries, but was interested in sweet potatoes and it was nice to see I could get just what I wanted. Service was a little slow. As I looked down the bar I could see people eating fish and chips, while I was still waiting for mine. Those patrons had come to the bar much later than we had. A special ketchup came with my fries and this was the first time I was disappointed in a Pacific Grill condiment. It was too sweet. With sweet potato fries just plain Heinz is my ketchup of choice. I like the acid, it's a nice counter-balance to the sweetness of the fries. We enjoyed the beer-battered catch-of-the day, but my favorite fish and chips still comes from The Spar Tavern (one block from Puget Sound), and Katie Downs (on Puget Sound). We had passed both on the way downtown. Peg wanted the Meyer Lemon Cheesecake, but was informed that they were all out. 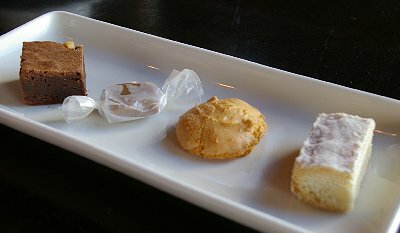 She chose instead the cookie plate: a brownie, a salted caramel, an amaretto cookie, and a piece of vanilla shortbread. I would prefer a cookie jar rather than a cookie plate, but the cookies were excellent. I took a small bite of the brownie, Peg took a small bite of the shortbread, tasted the amaretto cookie and then we each got the large left-over portion of our choice. I took a nibble of the shortbread, which Peg finished. I finished the amaretto and Peg gave me the salted caramel. They were a nice ending to a nice lunch. Happy Hour at Pacific Grill, which lasts all day in the bar, makes this fine dining establishment quite the lunchtime bargain. Prices were half-off and our bill came to a little over $24 plus tip. I've certainly paid more elsewhere and enjoyed it less. Excellent food and very, very reasonable prices are unusual and a pleasant surprise. Leaving the restaurant, we headed to the University of Puget Sound. We knew they had a new exhibit, but neither of us could recall what it was. We drove onto the campus and parked within eighty feet of the gallery at Kittredge Hall. Living close to U.P.S. is just like living near Puget Sound. There are so many benefits. Not only is the gallery free, but concerts, plays, and special programs with well known speakers at U.P.S. 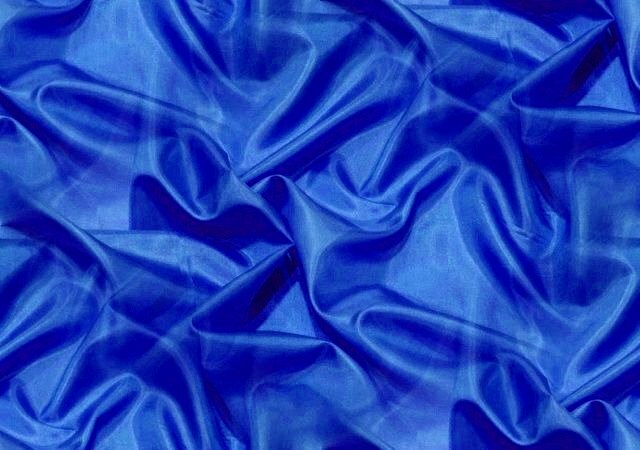 are priced at less than $20 . . . sometimes much less. Since I was an art student when I attended the university I virtually lived in Kittredge Hall, which is where most of the art classes were held at the time. Now, most of the ground-level of the building is used for the gallery. The exhibit was "Inchoate" by artist Brian Benfer. Brian has served at numerous academic posts and has presented his work at such venues as the Ohio University School of Art (Athens, OH), Temple University�s Tyler School of Art (Elkins Park, PA) and Houston�s Center for Contemporary Craft (Houston, TX). The gallery features Brian's "series of wall rubbings that highlight the variations and imperfections of the gallery walls." Supposedly the rubbings are to remind us of the hidden history the walls have recorded. Sounds a little like Stephen King. Mostly they rubbed me the wrong way. Can anyone say "pretentious?" I visited Brian's website as well, which had a hidden history of capitalization. The entire website only uses lower-case letters. When someone sends me an email without the use of capital letters I label them with worse titles than pretentious . . . starting with the question, "Is this person a first-grader?" However, I did like Brian's collection of bald baby heads, half of which faced one long wall, and the other half faced the other long wall, so they could enjoy the rubbings. The bald baby heads did give me an artistic flash of creativity. I had the urge to grab felted mallets and play Heart and Soul on their tiny little heads, or croquet. From the University of Puget Sound we headed down to Puget Sound. 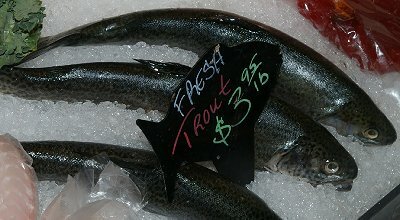 We stopped at Northern Fish to buy some of their trout at $3.95 a pound. 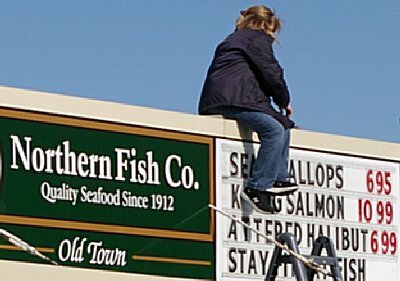 As we pulled up to the dock, one of the staff members was on the roof of Northern Fish to change the read-a-board. I was freezing in the wind at ground level, I can only imagine how she felt up in the air. I granted a favor and went inside where the other staff person took a plastic "one" out of her back pocket. I returned outside and held it on high, saving a trip down the ladder for the roof person. I said, "I hope you aren't changing the price of the trout." "No," she said, "there are still some on sale." When we drove up the sign offered Sea Scallops at $6.95 a pound; after my help the price jumped to $16.95. That crushed Peg's dreams, but I completed a deal for the last three rainbow trout (less than $7.00!). They looked really good, but would look even better in some flour and cornmeal, while basking in olive oil in our black cast-iron frying pan. We drove home just as the refuse people emptied the recycling container in front of our house. The wind immediately sent the other one free-wheeling about five feet along the driveway - such a big target for the wind. Peg and I hustled the garbage container and two recycling containers off the street and the driveway, back to safety beside our stucco home and half hidden by a large Himalayan Cedar, the national tree of Pakistan. (The cedrus deodara pollinates for a month at a time, at least twice a year.) It was a relief walking inside our warm home and looking out the windows at the dark blue and beautiful Puget Sound, located just a few minutes and quite a few temperature points away. Lunch at Pacific Grill and Bald Baby Heads at U.P.S., pacific grill restaurant tacoma, northern fish tacoma, university of puget sound, kittredge gallery tacoma, Lunch at Pacific Grill and Bald Baby Heads at U.P.S. university of puget sound tacoma wa washington.